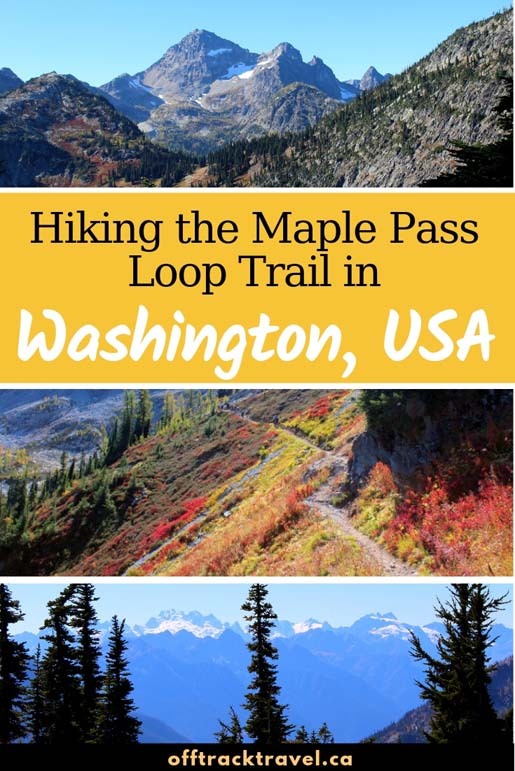 Breathtaking and mind-boggling beautiful from almost start to finish, the Maple Pass Loop trail has to be the most rewarding and satisfying 12km I have hiked anywhere. 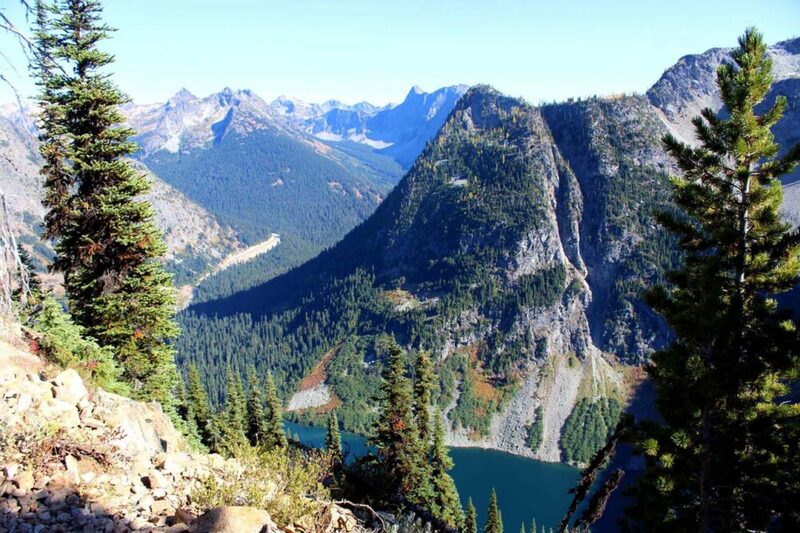 The Maple Pass trail is a North Cascades hike that is just stunning from every angle. Seriously, I think my jaw was on the ground for most of our day hike. And this isn’t the only epic thing about this trail. Oh, where to begin. 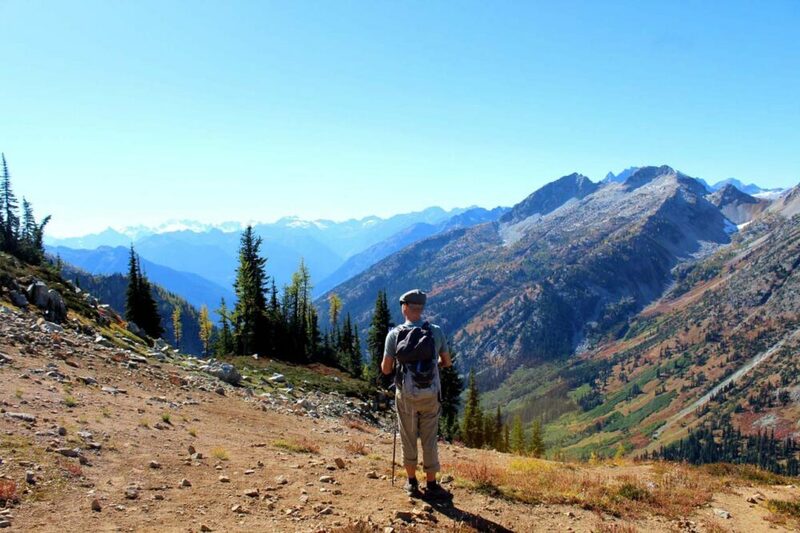 The highway journey to the Rainy Pass Trailhead only hints at the beauty to come on the Maple Pass hike. But what a hint this is! 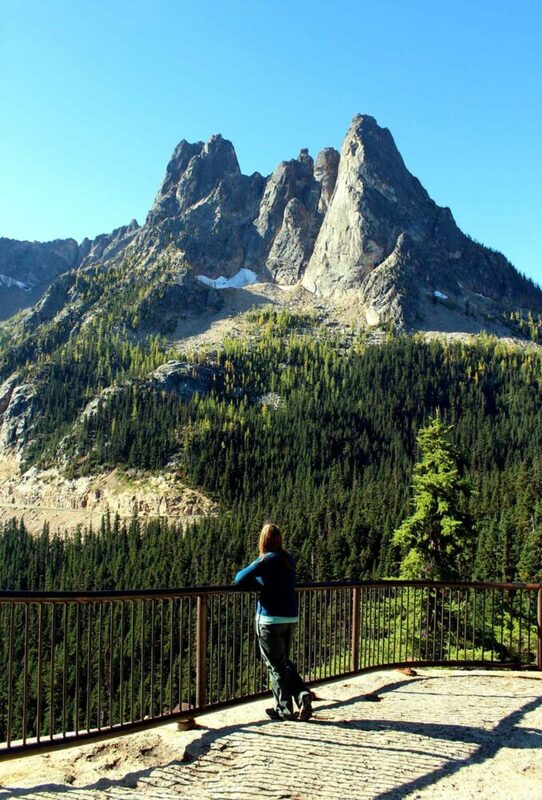 The dramatic spires of the Liberty Bell mountains stand guard over Washington Pass, the highway’s highest point. 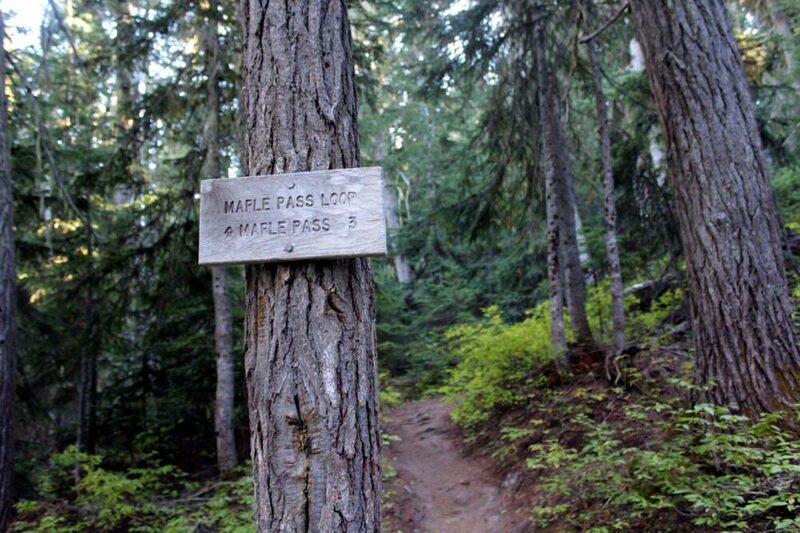 A short five-minute drive later and the Maple Pass trailhead beckons. The hike into the alpine starts. No matter which direction is picked (more on that later), the only way is up…and up…and up. The steady ascent and switchbacks ascending the pass seem relentless at first. Relief finally comes not in a descent, but rather the first views of jagged peaks above the treeline. And the rewards keep coming. Soon, an azure lake, almost too blue to be true, also comes into sight. 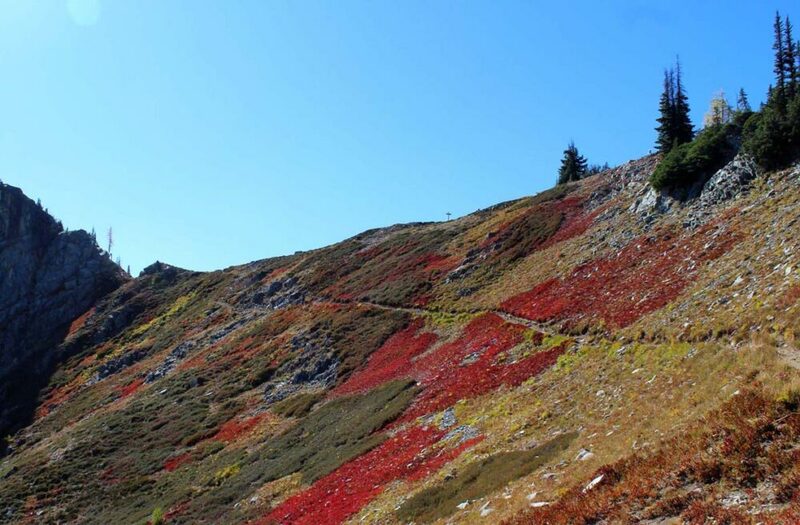 Lining both the trail and the lake are lined with warming shades of orange, red and yellow from the heather and huckleberry bushes. 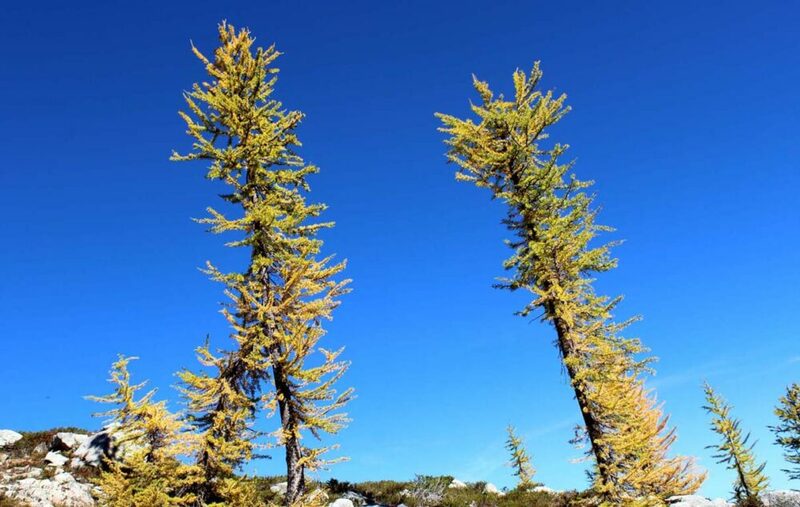 The larch trees (usually sporting soft, green needles) are just turning golden, a stark contrast in front of the cloudless blue sky. 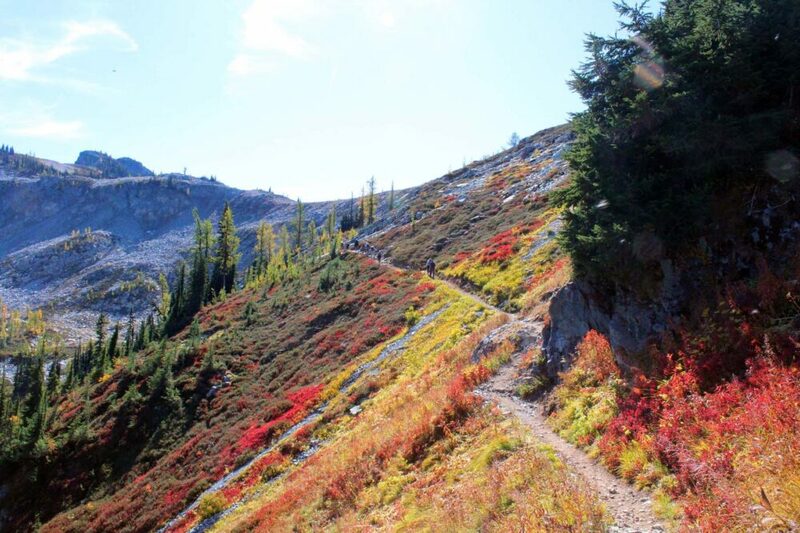 Every season would no doubt offer something a little different on this North Cascades trail (summer wildflowers, the first winter snow) but late September was bright with stunning autumnal colours. A ridge connects the Heather and Maple Passes. The panorama stretches from neighbouring steep granite peaks, alpine lakes and delicate meadows to distant snowy mountains. 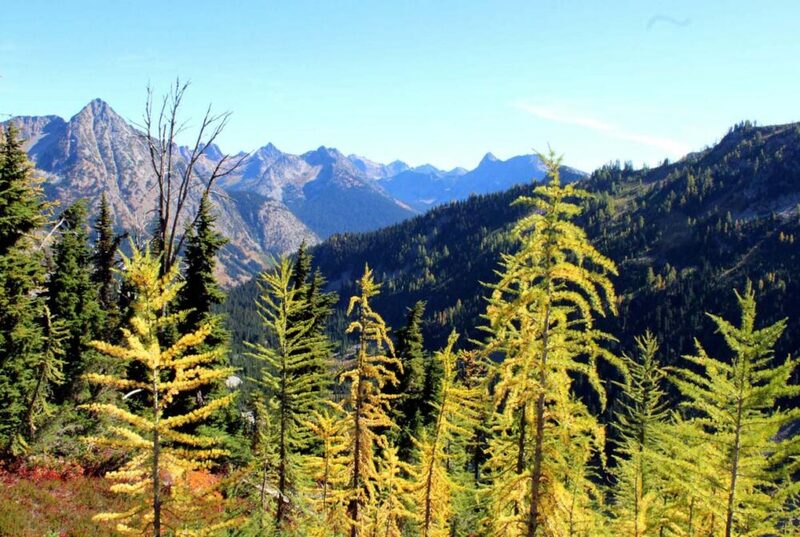 The slopes are studded here and there with golden larch trees. A few patches of stubborn snow lay in the shadows of the peaks nearby. The highway feels like a million miles away (actually only about 3.5miles/5.5km!) Despite the popularity of this trail, it’s easy to get your own private view and take it all in. From the ridgeline, it is all downhill after this. Ascending the other pass offers similar views but from a different perspective. Another alpine lake, a steeper or more gradual grade, an alternative angle on now-familiar mountain peaks. 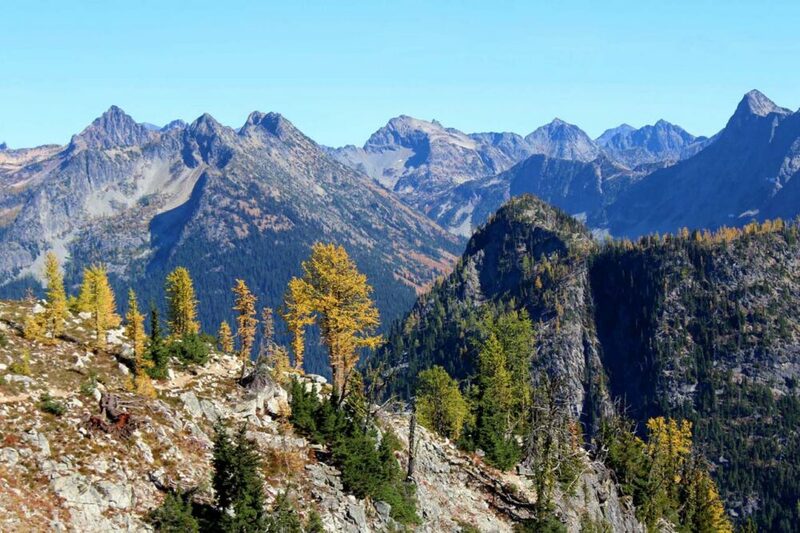 But still, the fiery heathers remain alongside the delicate larches, framed by seemingly endless summits and valleys. 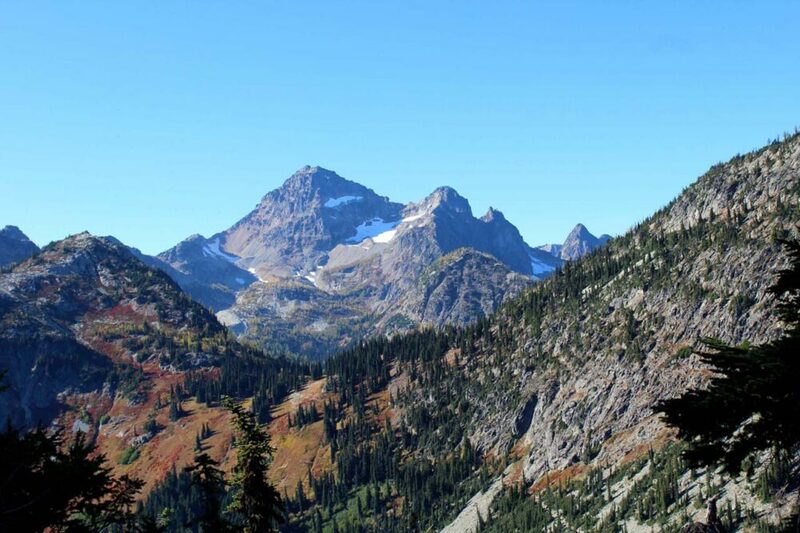 The Maple Pass Loop is an incredibly satisfying North Cascades hike all the way from the ridgeline to the highway. 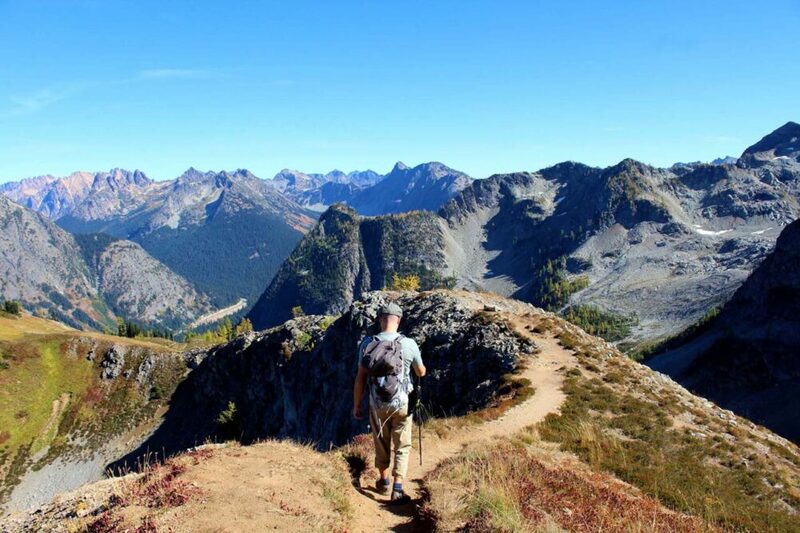 Being a loop, hikers can choose which way to travel on the Maple Pass trail. We hiked anti-clockwise and I was very pleased with our decision. I don’t think I would have liked the steep ascent clockwise and having to wait to see the best views. We chose not to visit either of the two lakes en-route, preferring to see them from above. 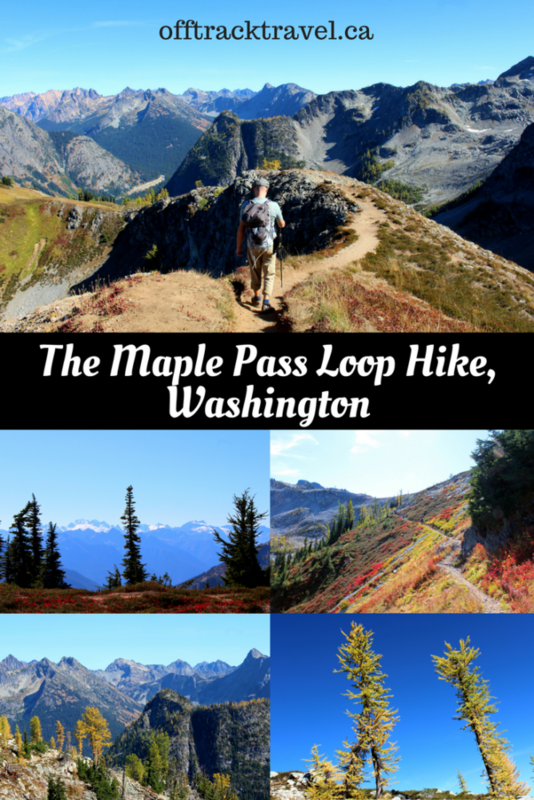 Follow the Maple Pass signs to hike the loop clockwise. There is an optional short detour at the beginning to visit Rainy Lake. The main trail has a steep ascent with many switchbacks. The views are slower to appear. The descent is much gentler and therefore may be faster than the alternate route. Follow the Heather Pass signs to hike the loop anti/counter-clockwise. The trail ascends gently with wide switchbacks all the way to the ridge. There is an optional short detour about 2km in to visit Lake Ann. Views of the lake can be seen quite soon from the main trail after the turn-off. The descent back to the parking lot is steep and rocky, which can be difficult on the knees. 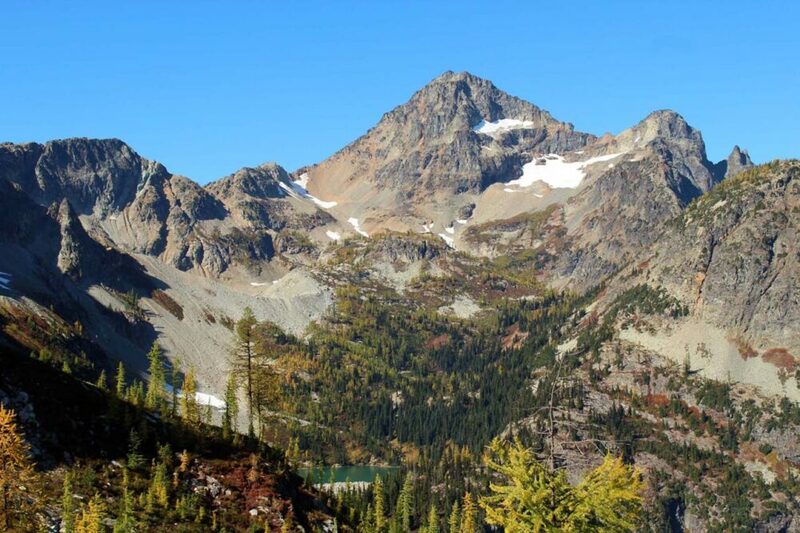 The Northern Cascades may be closer to Canada than you think. 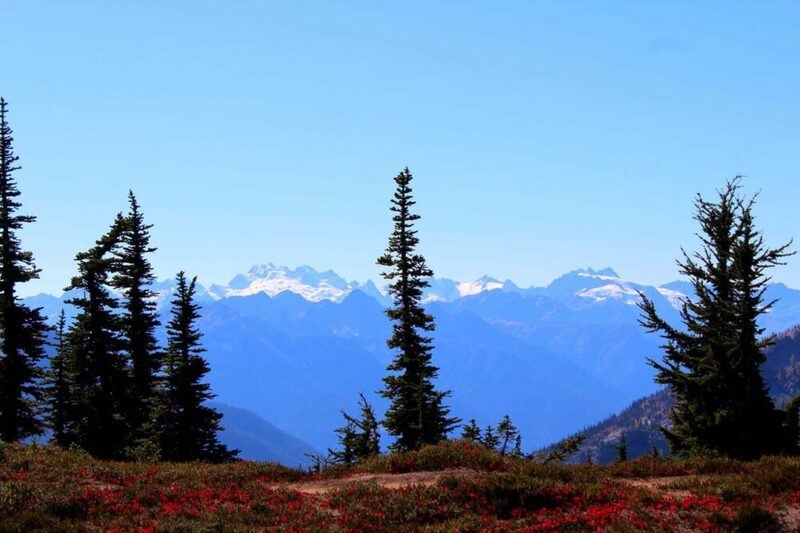 As mentioned, the Heather Trail pass trail is 50km south of the Canadian/USA border in the Cascade Mountains. Of course, the mountains block any kind of shortcut to Canada so the trailhead is actually a 400km round trip from the Osoyoos/Oroville border crossing. Sounds like a lot? Maybe, but that’s only about 20km less than the round trip distance from Osoyoos to Manning Park on the Canadian side of the Cascades (even from Vancouver, the difference in distance isn’t dramatic). The trip to the Northern Cascades actually faster too, with most of the journey being flatter and easier to drive. Of course, the border crossing has to be taken into account but we did this at 9pm at night with no other vehicles in sight. 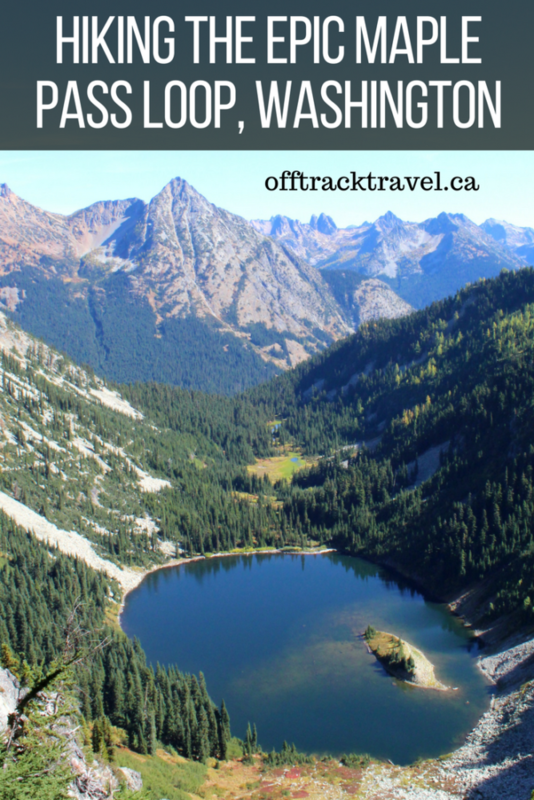 Our original plan for this September adventure was to go to Manning Park and see the larches at Mt. Frosty. 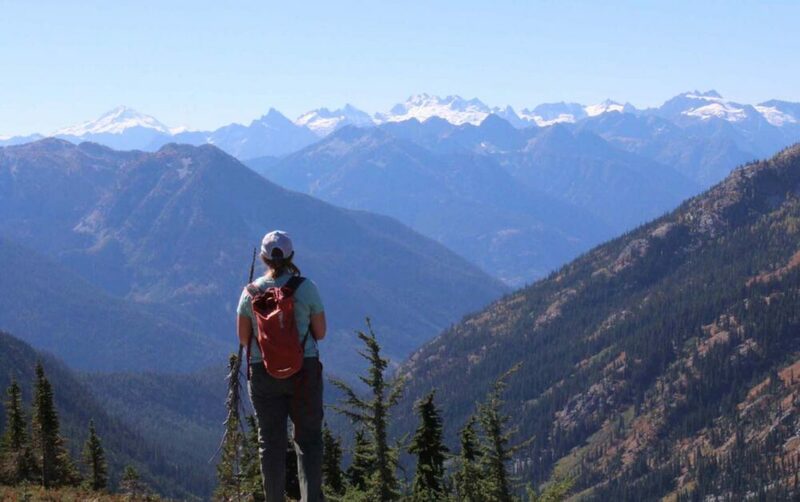 Since we had already spent time in Manning only a few weeks before, visiting the US side of the Cascades provided a welcome change. The Maple Pass Loop trail is located in the Okanogan-Wenatchee National Forest in Washington. 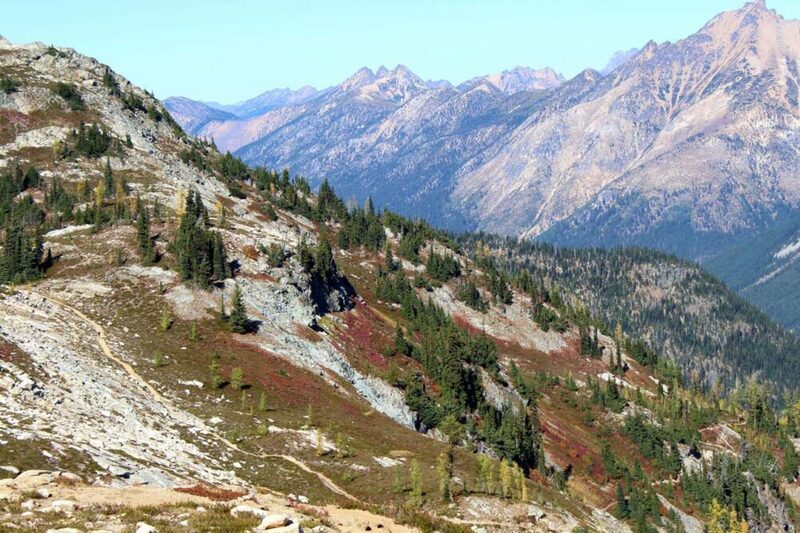 The ridgeline between the passes is just on the edge of the Northern Cascades National Park. 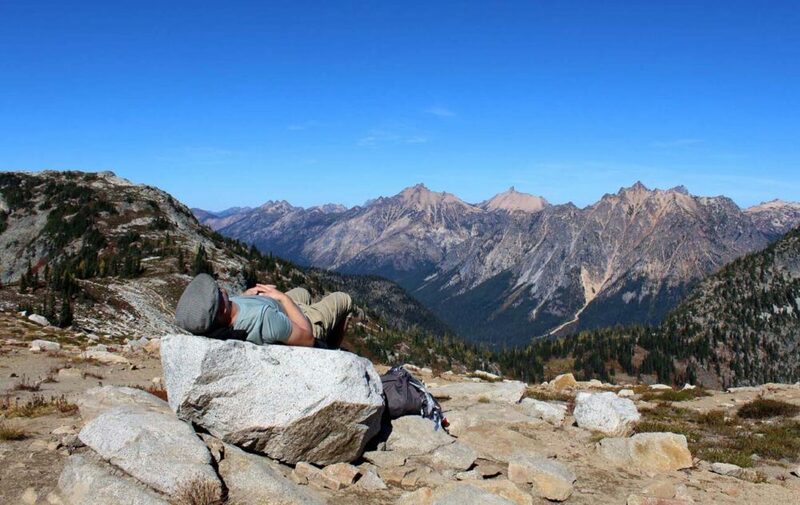 The trailhead for this North Cascades hike is a 40 minute (35 miles/56km) drive west of the small town of Winthorp. 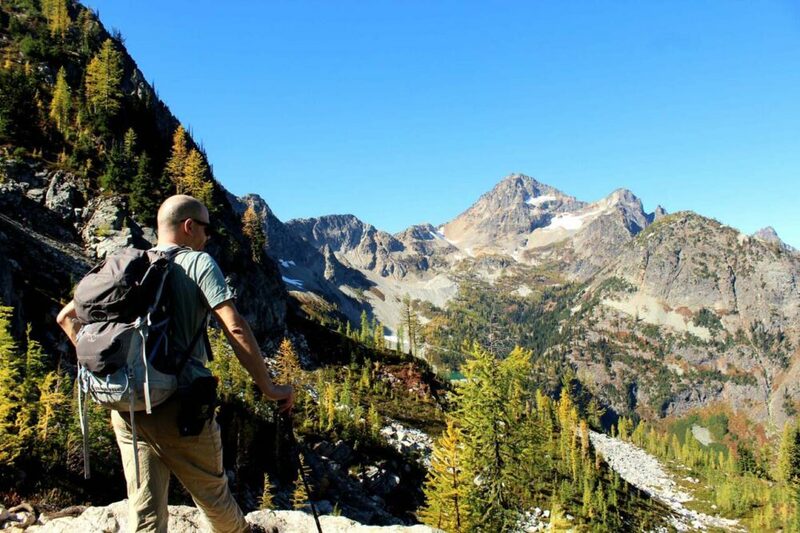 Planning a stay in Winthrop before or after your hike on the Maple Pass loop? 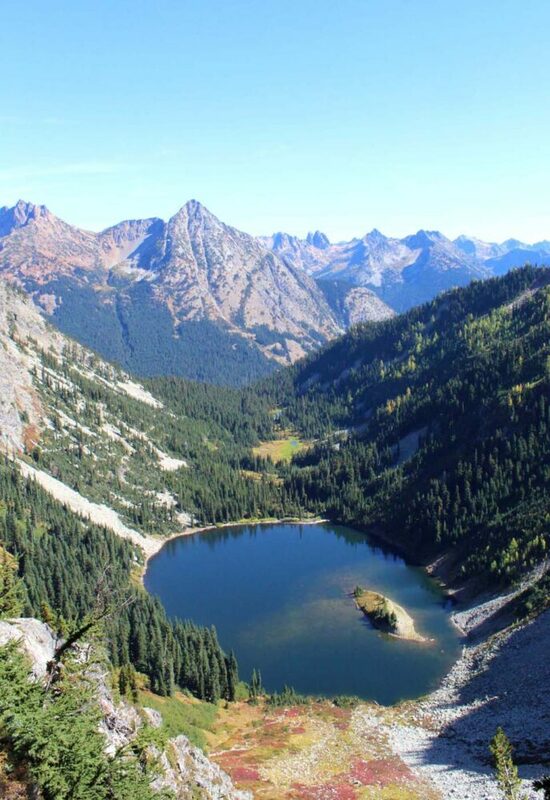 The hike is sometimes known as the Lake Ann/Maple Pass Loop Trail or the Heather-Maple Pass Loop. Regardless, it is a 12 km (7.5 mile) circular hike with 600m elevation gain. We were hiking for just over four hours, stopping for an additional hour for lunch on the ridgeline. 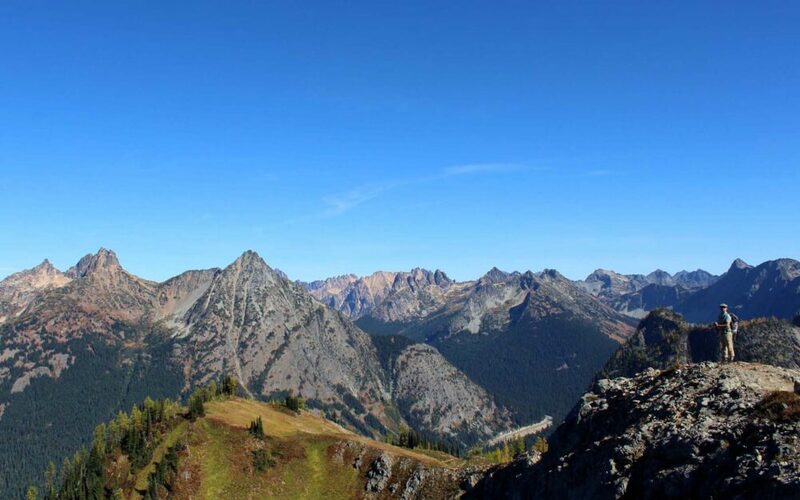 The Maple Pass Loop is a popular trail with the Rainy Pass Trailhead parking lot quickly filling up on both weekdays and weekends in August and September. There is, however, another parking lot available on the other side of the highway (Pacific Crest Trail). While this is a popular trail (and rightly so), the amount of people on the trail didn’t actually bother me. And I say that as someone who usually keeps well clear of any backcountry experience that attracts crowds. 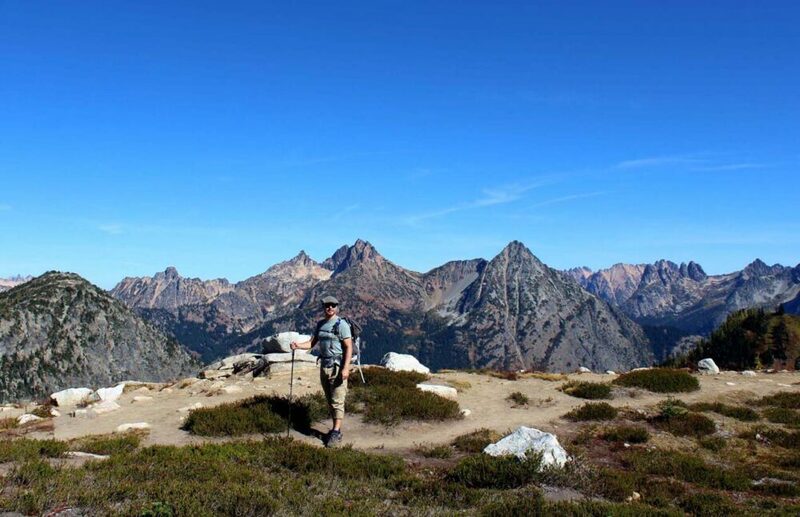 Being an alpine hike, weather and trail conditions can be super variable. The day of our hike in September was surprisingly sunny and hot (25c) but it could have been quite different. Two weeks before this we were hiking just over the border in Manning Park and experienced freezing temperatures. Be sure to carry the 10 essentials. 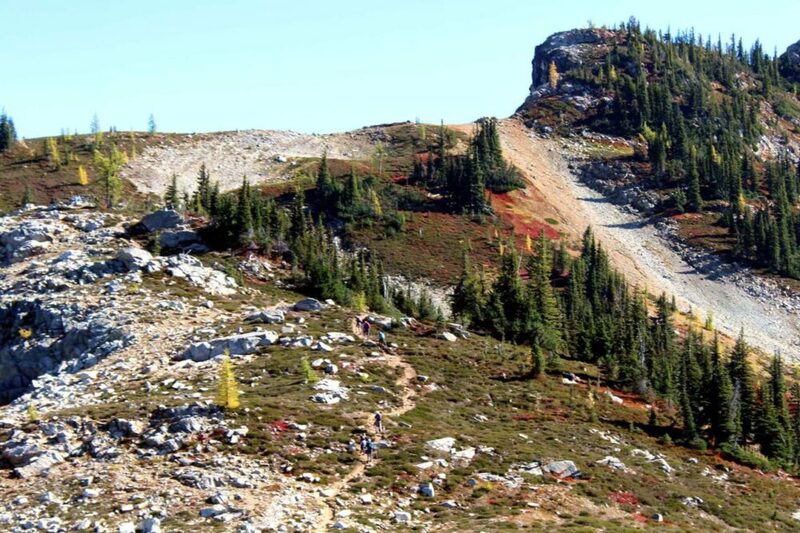 Recent trail conditions are reported regularly on the Washington Trails Association website. 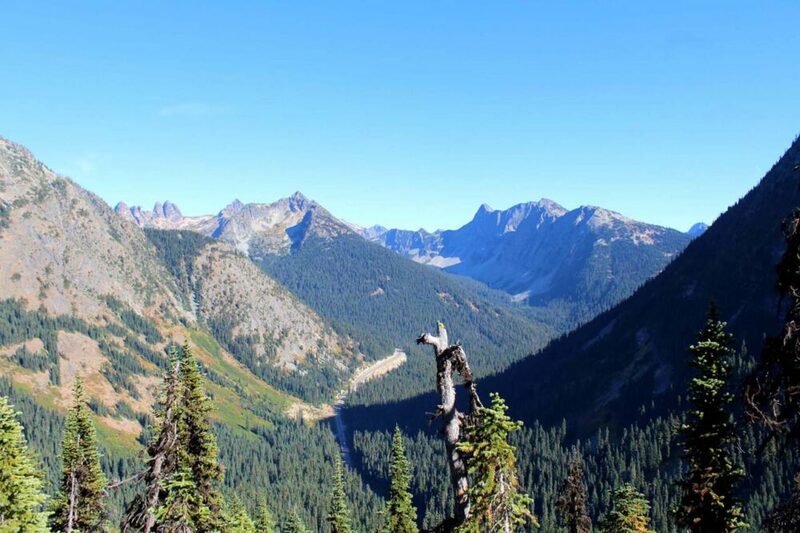 Users of the Heather-Maple Pass Loop must have a valid National Forest Pass – the current fee is $5 per day, per vehicle and is available for purchase in the parking lot at the start of the hike. Remember to always practice Leave No Trace principles when exploring in the backcountry to help preserve beautiful places such as this. If you liked this post, PIN or save it for future reference using one of the below photos!